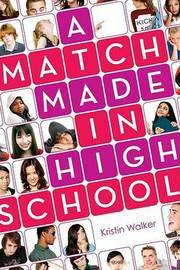 When the principal announces that every senior must participate in a mandatory year-long Marriage Education program, Fiona Sheehan believes that her life can't get any worse. Then she marries her "husband"--jerky jock Todd, whose cheerleader girlfriend, Amanda, has had it in for Fiona since day one of second grade. Even worse? Amanda is paired with Fiona's long-term crush, Gabe. At least Fiona is doing better than her best friend, Marcie, who is paired up with the very quiet, very mysterious Johnny Mercer.Pranks, fights, misunderstandings, and reconciliations ensue in an almost Shakespearean comedy of errors about mistaken first impressions, convoluted coupling, and hidden crushes. Kristin Walker has been writing for teens and children for several years. Her fiction and poetry have appeared or are forthcoming in magazines such as Ladybug and Wee Ones, and her essays can be found in two Chicken Soup for the Soul books. She lives in a Chicago suburb with her husband and three sons. A Match Made in High School is her first novel.